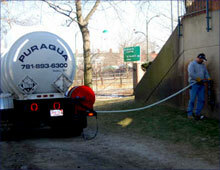 Puraqua specializes in liquid chlorine delivery to virtually any location in eastern and central MA. We deliver liquid chlorine to commercial swimming pool facilities ranging from summer camps, health clubs, YMCA’s, universities. and municipal water and sewerage plants. 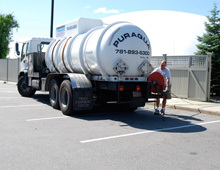 Our drivers are all commercially licensed to transport liquids and hazardous materials. The trucks are 27 foot long ten-wheelers which allow the trucks to fit into tight access areas. 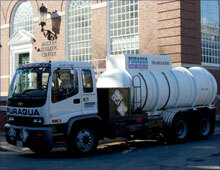 We deliver in quantities from 50- 2400 gallons and are able to pump a distance of 200 feet. 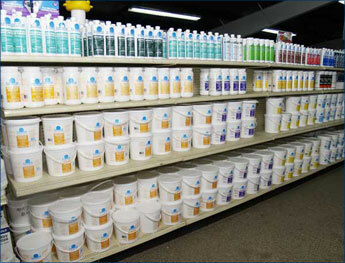 Puraqua also delivers and carries a full line of swimming pool chemical and testing reagents.